Find out when you'll be able to run amok in Rockstar's port of the hit PlayStation 2 adventure. 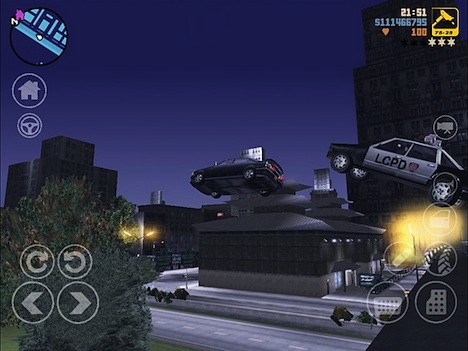 A while back, Rockstar announced plans to port its PS2 classic, Grand Theft Auto 3, to iOS and Android, but said little about the official release date. Today, we're happy to report the game will debut December 15 on both the App Store and Android Marketplace for a reasonable $4.99. Apple iOS Devices: iPad and iPad 2, iPhone 4 and iPhone 4S, iPod touch 4th Generation. Android Phones: Motorola Atrix 4G, Motorola Droid X2, HTC Rezound, LG Optimus 2x, Motorola Photon 4G, Samsung Galaxy R, T-Mobile G2x. Android Tablets: Dell Streak 7, Acer Iconia, Asus Eee Pad Transformer, LG Optimus Pad, Motorola Xoom, Samsung Galaxy Tab 8.9 and 10.1, Sony Tablet S, Toshiba Thrive. Sounds good. We just hope those virtual controls do the game justice.